A survey conducted by NAPA Group, the leading software house for ship design and operations, into preparation levels for the upcoming IMO ship energy efficiency management plan (SEEMP) has revealed that a majority of respondents were unaware of scope of potential fuel savings the plan could trigger. 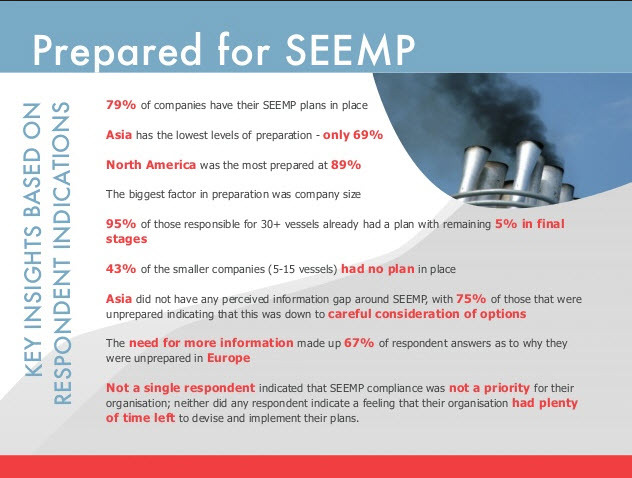 The survey completed by over fifty ship owners, operators and charterers, revealed that the industry is taking responsibility for SEEMP compliance seriously and is optimistic about its benefits. However, the focus for most respondents was to ensure compliance and maintaining a business-as-usual approach, rather than implementing a SEEMP with significant potential fuel savings. The findings also revealed a significant variation in preparedness for SEEMP between small and large companies and between Europe and Asia. Individual responses described SEEMP as “absolutely needed”, “long overdue” and “one of the best practices”; an assertion re-enforced by the fact that 79% of respondent organisations already have a system in place for SEEMP compliance. Company size was identified as a key factor in levels of preparedness – with 95% of those responsible for 30+ vessels “prepared” with the remaining 5% in final stages, compared to companies with 5-15 vessels who had the lowest preparation rate at only 43%. “It is enormously positive to find that the industry is so prepared for the upcoming SEEMP regulation – however it is important to understand that in utilising electronic SEEMP and modern software solutions savings of as much as 20% can be achieved. NAPA has long maintained that SEEMP regulation is there to help owners and operators help themselves and it is heartening to see that this opinion is shared by most of our survey participants.